This Made in the USA family word game encourages you to come up with as many words as you can in 60 seconds that contain that round’s snippet—which is a short series of letters. Think freely and fast. You can come up with almost anything in this game—real dictionary words, proper names, acronyms, slang, and even words that aren’t in English. You’ll score points for words no one else has which means creativity, and not just a big vocabulary, are the key. It’s a fun game. And I learned a lot Of new words that were in the urban dictionary. This game received great reviews from a game-playing family with competitive teenagers. Our family loves board games after dinner and this one has been a hit! Fun for old & young! Family loved it! Including a 70 yr old grandmother & a 10 yr old grandson! 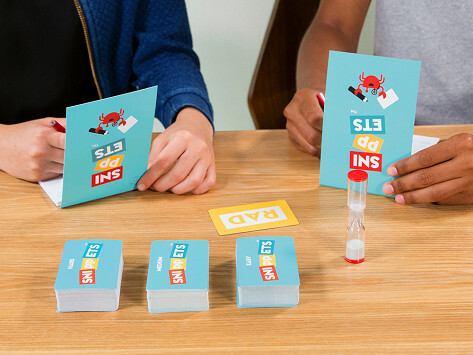 Snippets is Made in the USA and breaks all the rules of traditional family word games. You get a snippet, which is a short series of letters (e.g., upp), and 60 seconds to come up with as many words as you can think of that contain it (think: supper, Tupperware, etc). They can be real dictionary words, proper names, acronyms, slang—even words that aren’t in English. Think fast. Literally any word is fair game. Once time is up, you get a point for any words that no one else got. There are three different decks, with snippets that are easier, tougher, and the most challenging. We suggest starting with the easiest deck to get the hang of it. The winner isn’t the person with the biggest vocabulary. It’s more likely to be the one with the greatest creativity. To win, you have to free associate quickly, like you would when you brainstorm. Maker Shaun Salzberg’s journey was unconventional. He first invented the game as a phone app, then he turned it into old-school, game-night entertainment. We’re happy he did. This fast-paced, brain-flexing activity is fun (and funny) for the whole family.